When it comes to having children, my husband and I believe that “winging it” is just not wise. We like to be as intentional and proactive as we can be. Baby Wise has helped us to parent my son with confidence and wisdom, as well as some good night’s sleep! Starting a little after three weeks of age, a few friends from church mentioned this “Babywise” – after hearing of their success I quickly hopped on Amazon and ordered me a copy. Of course the mail took about a week to arrive, in which one of my friends came to the rescue with “The Baby Whisperer” book – which got us started with a routine. After reading both books, we found Babywise to be simpler and follow it more due to that. I don’t need more complications, and Babywise is so simple and makes so much sense. July makes 5 months for my son. He is “thriving” according to doctors and is a happy, healthy boy. At first, we had to be pretty strict getting his routine established, which upset some people close to us. Some people didn’t understand why I was “forcing” him to nap or eat when he wasn’t screaming his head off (by the way, crying is one of the last signs of hunger, not the first. On a routine, you know you’re baby is going to be hungry when he wakes up from his nap, and you don’t have to wait until he’s miserable to let you know), or said we weren’t “spontaneous” enough, etc. After his routine was well established, it gave us such flexibility (within reason) to run around with our son and just live life – interruptions and all. He is still a normal baby and is fussy at times (especially now when he is teething) – but for the most part, if my son is fussing, it’s for a reason. Babywise helps my Type A personality parent in an organized manner, not a haphazard “do whatever” type – and I think any baby can appreciate that, as they know what to expect. In case you’re unaware of Babywise – here’s the basics in a nutshell. You wake your baby up around the same time each day, then you feed them. Then they have activity time, then they take a nap. Then you wake them up, feed them, activity time, nap. It’s Eat-Activity-Sleep all the way until bedtime, which you should establish. What’s nice about this routine is that it teaches them not to associate feeding with sleeping (ever try to get a sleepy baby to eat their full bottle??) and helps them get enough food and rest in during the day that pretty soon they are snoozing all night long! Our son started sleeping 8-9 hours around 9 weeks old and by 12 weeks he slept from 8pm when we laid him down until around 6:30am when I woke him up. There are exceptions – he was too hot the other night (change of seasons) and he fussed a few times in the night. The next night, we gave up footie pajamas and he’s doing great at night again. It is normal to expect and help babies sleep through the night – you try taking continual naps around the clock and see how well rested you are! Long periods of sleep help their brain develop and you should see my happy, smiley baby in the morning! And I do like getting a full night’s sleep again as well. What’s also nice is that Babywise is NOT a schedule, it’s a routine. He sometimes wakes up at 10:30 instead of 11, sometimes he goes to bed a bit later because we are at our Bible study, sometimes he doesn’t eat as much and has more later on. I am directing him as the parent, but he still lets me know when he’s full, hungry, sleepy, etc. and the times change every day slightly. I don’t say “8:30am, nap time!” – sometimes he doesn’t go to nap until 8:45 or sometimes he’s tired at 8. He usually naps pretty well unless he is teething and has not eaten a very good meal prior to his activity and nap time. At night, we just place him on his tummy and, if he isn’t asleep by the time we tuck him in, he’s asleep shortly thereafter on his own. I never have to “tip toe” quickly out of his room, praying he stays asleep. No thank you! During activity time, we do all sorts of things. No activity time is the same. Sometimes I run errands during his activity time, he loves to look around at new places and things. Sometimes for part of his activity time, he will play under his play gym by himself and be content; and I’ll go make lunch or do the dishes or just sit near him and crochet. Other times, we’ll read a book, sit on the front porch and people watch, cuddle, whatever! 🙂 It’s a fun time, especially now that he is staying awake longer. After a good nap and bottle, he is so alert and happy and ready to play. All in all, Babywise has given us confidence and peace in our home with our son. When my son is crying, I usually know why. I’ve seen some parents question if their child was fussing because they were hungry or tired, not really knowing. With our son, I can look at the time, look at how he is acting and know what he needs. This isn’t a life ruled by the clock. It’s a life where I look to my son for cues, look to the clock for routine and use the brain God gave me to be a parent. I don’t expect my son as an infant or child to know what is best for him, that’s my job as his parent. Parent-directed parenting, thankyouverymuch. And we are so grateful! Even if you don’t follow Babywise, I would recommend a routine of some sort. Routines are not evil, maybe a schedule is. But my son never eats or sleeps at exactly the same time, but he does have a pattern or routine that he follows each day – just like you and me. I wake up, get ready for work, eat breakfast, go to work, etc. It’s my routine. My son has his “norm” too, and he’s doing great. I was once told that I get the comfort from the routine, not my son. Yes, I am comforted by the way I parent – I think if the way I parent wasn’t working for me, it would be silly to continue parenting that way. I have seen my son happy and healthy on his routine and cranky and upset, tired and pushed to his max when he is off his routine. What is better for my baby – rest and routine or chaos and the unknown? Yes: me, my husband and my baby all benefit from our parenting style. And while I do have a very good baby, we also put a lot of hard work into establishing his routine – so don’t call us lucky! We are blessed by our boy, and blessed to have implemented the routine. Previous Post Babywise Success Stories Week–Social Media Blast! These are all great reasons. We are babywise parents and I recall getting a lot of criticism from my in-laws about putting my son on a "schedule". 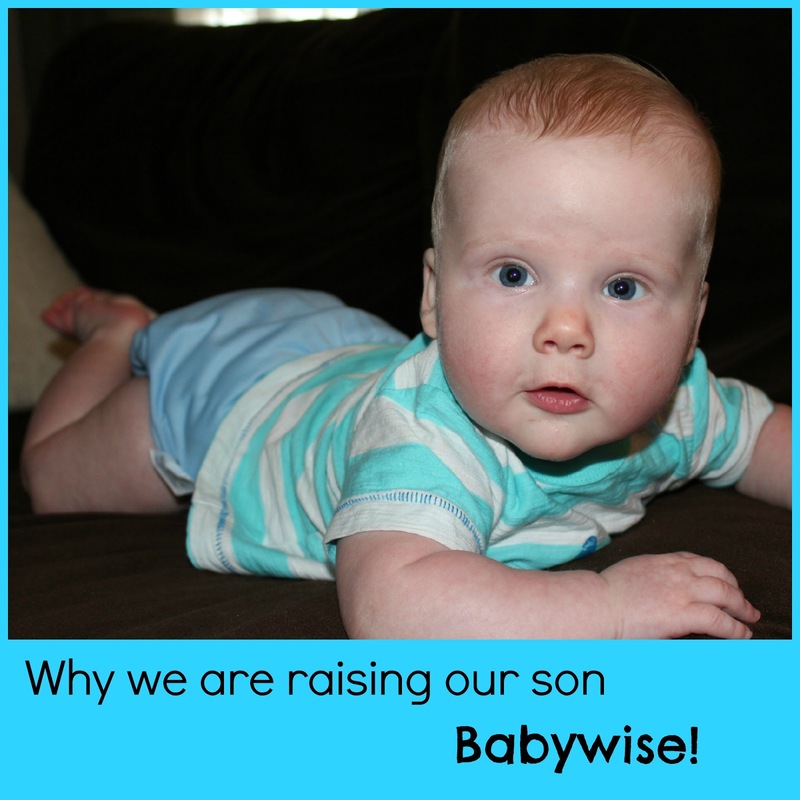 But babywise gave us confidence as parents and was very helpful. You know, I'm not sure how people feed their babies to sleep anyway. All three of mine have suffered from painful gas bubbles for sometimes up to an hour after feeding. They can't burp lying down for at least a few months. If I fed them to sleep, it would be an endless cycle of feed, wake in pain with a gas bubble, burp, feed back to sleep, and on an on and on. So thankful for Babywise! This is such a perfect explanation! Thank you for sharing!I don't know if I'll get an answer to this question but wanted to try….My LO is almost 5 months old and has been doing 1 hr. 15 min of wake time before I notice her cues for being tired. Problem now is that she still gives tired cues at that amount of time, but is taking shorter naps, short enough that we've regressed to having four naps instead of the 3 longer ones we had established just two weeks ago. Is it possible I'm wrong and she needs to be awake longer? And how far do I jump? Many people have told me she should be awake between 1.5 and 2 hours. My other problem is that she's not eating very well (nursing) at the beginning and is suddenly hungry before going down to nap. She starts shouting at me when I try to force her to continue nursing(will eat from a bottle no problem). Is this weaning? And how do I stop it?? If I can…But I'm nervous we're starting a routine of EAT/WAKE/EAT/SLEEP, since I hate to put her to bed hungry….Help!